Les Moonves, the chief executive of CBS, was speaking at the Morgan Stanley Technology, Media, and Telecom Conference, when he decided to reveal one of the sad truths of modern media that is well known to insiders. It’s something that is representative of the core principles (or lack thereof) of a once noble profession that has been co-opted by greed and the corporate craving for power. With reference to the campaign of Donald Trump, Moonves was caught bragging about the cash cash cow he was unashamedly milking. Moonves: Who would have thought that this circus would come to town. It may not be good for America, but it’s damn good for CBS. That’s all I got to say. So what can I say? The money’s rolling in, this is fun. Make no mistake, this is an admission by Moonves that his lust for profit is a higher priority than his love of country. Worse still, this pursuit of wealth, in Moonves’ view, is actually fun, even as it’s harmful to the rest of the nation and his fellow citizens. That is a form treason. Yet Moonves admits that despite Trump’s campaign being divisive, hostile, racist, ignorant, and detrimental to the well being of the United States, he gladly welcomes the damage it will do so long as CBS rakes in more cash. And CBS isn’t alone in harboring these traitorous ambitions. The whole of the corporate media industry is guilty of the same self-interest. It’s why even MSNBC airs Trump’s stump speeches live in their entirety when they don’t do it for any other candidate. And it’s the result of the consolidation within the business that has thrust the profit motive over patriotism. These new multinational conglomerates have no incentive to be loyal to any nation, or to any anything other than their next quarterly earnings report. The one exception to this may be Fox News, whose owners and management are just as committed to pushing right-wing propaganda as they are to enriching their themselves. The profit incentive for the media has a toxic effect on democracy. It produces reporting that is driven by motives other than honestly informing the public. What Moonves is putting on display for all to see is the damage that can be done when a news enterprise can be justifiably suspected of distorting their stories in order to fatten their wallets. Moonves was literally rooting for Trump specifically because his brand of melodramatic demagoguery draws more eyeballs to the advertising the network is now selling for inflated rates. Moonves: I’ve never seen anything like this and this is going to be a very good year for us. Sorry, it’s a terrible thing to say, but bring it on, Donald, go ahead, keep going. […] “I’m not taking any sides, I’m just saying for us, economically, Donald Trump’s place in this election is a good thing. With cheerleading like that, how can anyone watch this campaign coverage and be confidant that they are being told the truth. 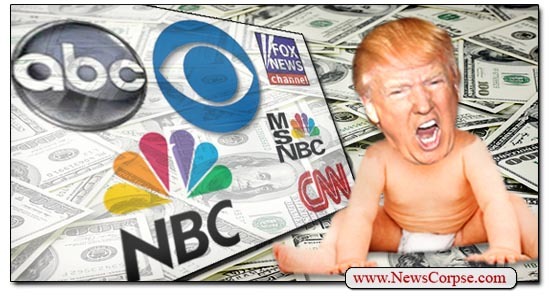 Clearly, the media has a profit motive to keep Trump in the race, and even boost his chances of securing the Republican nomination in order to keep the register ringing straight through to November and beyond. The other candidates are being deep-sixed because they can’t pull in the big bucks the way The Donald does. This isn’t democracy. There may not be a word for what this is. We could call it a capitalocracy to illustrate the fact that the worst elements of capitalism are what determines who our leaders will be. We may as well stop having elections and just give prospective candidates their own TV shows and the one with the highest Nielsen ratings becomes president. Oh wait a minute. That’s pretty much how Donald Trump got to where he is today. Curious what would be next after the election? How to keep the profits flowing? Televised executions? A new reality show where undocumented immigrants are voted out of the country? In other words, “Heil Donald”. Actually, there is: “Plutocracy.” Government (and media) of by and for an uber- wealthy elite. Thanks for this post, broadening your usual well-honed, well-timed and necessary critiques of Fixed Noise to take note of how the other “news” media are faring in this ugly year of Drumpf.